Posted on Common Dreams June 5, 2018. In what’s being called “hope for a better planet on #WorldEnvironmentDay,” a United Nations report published Tuesday found “surging momentum in global efforts” to eradicate single-use plastics while also warning that poor enforcement is hindering regulations and bans worldwide. Single-Use Plastics: A Roadmap to Sustainability (pdf) details “what has worked well, what hasn’t, and why” in terms of regulating plastic. The report was released by the United Nations Environment Program (UNEP) as part of a global effort on Tuesday to raise awareness about initiatives to #BeatPlasticPollution. 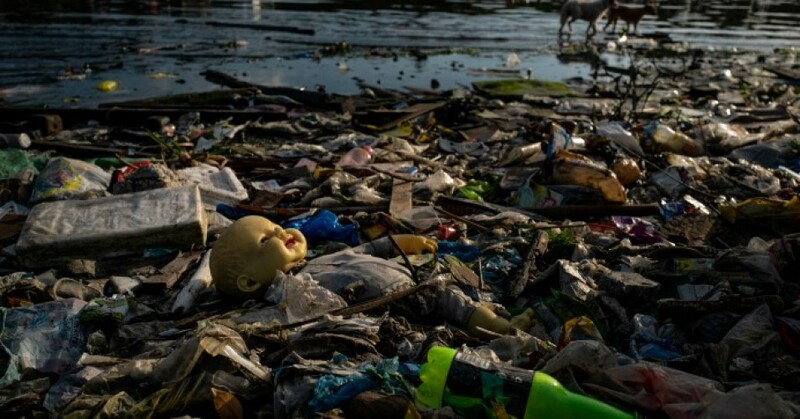 Plastic pollution has become “one of our planet’s greatest environmental challenges,” Erik Solheim, head of UNEP, wrote in the introduction of the report, the first comprehensive review of efforts in more than 60 countries to address the crisis. Just last week, a pilot whale died just off the coast of Thailand. “A necropsy revealed that more than 17 pounds of plastic had clogged up the whale’s stomach, making it impossible for it to ingest nutritional food. This waste was in the form of 80 shopping bags and other plastic debris,” reported National Geographic. Target the most problematic single-use plastics by conducting a baseline assessment to identify the most problematic single-use plastics, as well as the current causes, extent and impacts of their mismanagement. Consider the best actions to tackle the problem (e.g. through regulatory, economic, awareness, voluntary actions), given the country’s socio-economic standing and considering their appropriateness in addressing the specific problems identified. Assess the potential social, economic, and environmental impacts (positive and negative) of the preferred short-listed instruments/actions. How will the poor be affected? What impact will the preferred course of action have on different sectors and industries? Identify and engage key stakeholder groups—retailers, consumers, industry representatives, local government, manufacturers, civil society, environmental groups, tourism associations—to ensure broad buy-in. Evidence-based studies are also necessary to defeat opposition from the plastics industry. Raise public awareness about the harm caused by single-usedplastics. Clearly explain the decision and any punitive measuresthat will follow. Promote alternatives. Before the ban or levy comes into force,assess the availability of alternatives. Ensure that the pre-conditions for their uptake in the market are in place. Provide economic incentives to encourage the uptake of eco-friendlyand fit-for-purpose alternatives that do not cause more harm.Support can include tax rebates, research and development funds, technology incubation, public-private partnerships, and support to projects that recycle single-use items and turn waste into a resource that can be used again. Reduce or abolish taxes on the import of materials used to make alternatives. Provide incentives to industry by introducing tax rebates or other conditions to support its transition. Governments will face resistance from the plastics industry, including importers and distributors of plastic packaging. Give them time to adapt. Use revenues collected from taxes or levies on single-use plastics to maximize the public good. Support environmental projectsor boost local recycling with the funds. Create jobs in the plasticrecycling sector with seed funding. Enforce the measure chosen effectively, by making sure that there is clear allocation of roles and responsibilities. Monitor and adjust the chosen measure if necessary and update the public on progress. The U.N. report was developed in cooperation with the Indian government and the Ministry of Environment, Forest and Climate Change. It was unveiled in New Delhi by Solheim and Indian Prime Minister Narendra Modi, alongside an announcement by the Indian government that the nation will work to completely eliminate single-use plastic by 2022. It also comes as the European Union is considering a ban on 10 single-use plastics that, in addition to fishing gear, account for about 70 percent of marine pollution across Europe. Although campaigners welcomed the proposal as a step in the right direction, they maintain that it does not go far enough to address the issue.